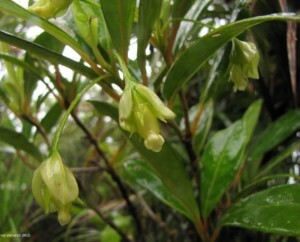 Coronanthera is the type genus for the Coronanthereae. The members of the genus are woody shrubs or trees growing in montane forests, up to 15 m tall. Corollas are generally small, and yellow green, sometimes red. The genus is comprised of about 11 species, distributed in New Caledonia (a French island complex east of Australia and north of New Zealand) and the nearby Solomon Islands.